Italian thistles in my field. Mother Goose rhymes were, of course, originally penned 300 years ago in the more-northern latitudes of England and France, where the growing season starts later. 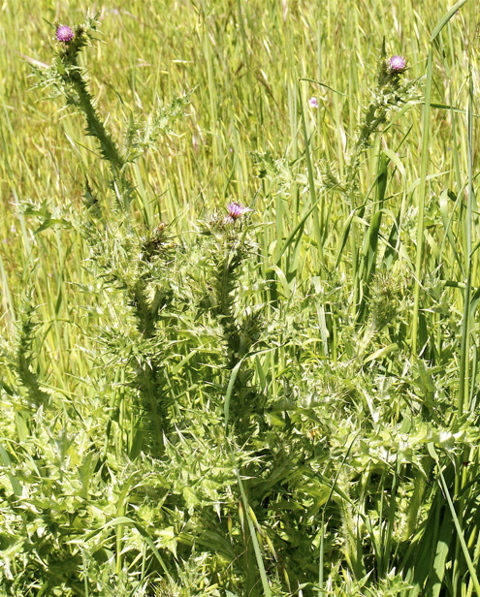 Thistles in West Marin should probably be cut a month or two earlier. I know because I have spent much of the last week cutting thistles, as well as pulling and digging them up. It has been an unpleasant task, and despite my wearing work gloves, my hands are now full of prickles. 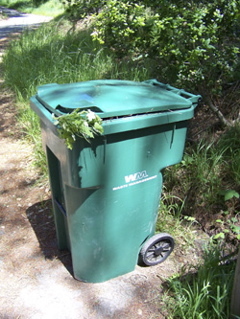 Yet I did manage to fill a green-waste container to overflowing, and I’ve already piled up more thistles for the next garbage pickup in two weeks. There has to be an easier way to do this, I thought, so I did what everyone with an existential question does this days: I looked for the answer online. 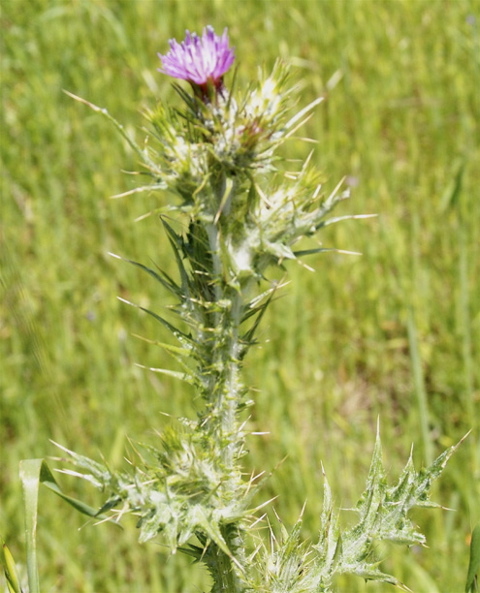 As it turns out, the Marin County Agricultural Commissioner’s Office has a helpful website, which I used to identify the type of thistle I was fighting: Italian thistles. Having identified these prickly invaders, my next question was how to easily get rid of them. Looking around, I found a Livestock for Landscapes website that said, “Cows eat distaff and Italian thistle.” The site included a link to a YouTube video featuring Chileno Valley ranchers Mike and Sally Gale. The ranchers had been interviewed four years ago just as they began experimenting with cattle to control distaff thistles. 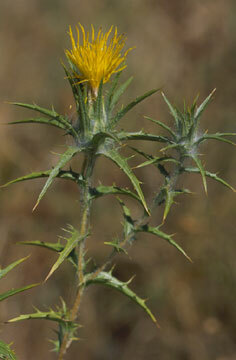 The tall, woody thistle is rapidly spreading throughout Chileno Valley, ruining pastures. Mike and Sally being old friends, I called them to find out how their experiment with using cattle to eliminate distaff thistles had gone. Not well, Mike told me. He and Sally had tried the Livestock for Landscape’s technique that began with cattle in a pen. The ranchers put cut thistles in a tub and poured molasses on them to get their livestock interested. That part of the experiment worked, but when the cattle were put out to graze, they ignored thistles in their pasture, he said. So what was the solution? 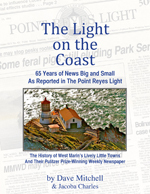 Mike said the Marin County Fire Department for the past two years has conducted controlled burns in the pasture, and that has greatly reduced the amount of distaff thistles. My thistles, however, are Italian, and Mike said cattle will eat Italian thistles and even seek them out. That would seem to make my thistle problem easy to eliminate. All I would need to do is acquire a few cattle, as well as install a few fences and gates. As for cutting thistles, Mike agreed with Mother Goose. If I cut them too early in the spring, they’ll grow back, but if I wait until they’re full grown, they won’t. The trick, I gather, is timing. Once thistles flower, they produce seeds that the winds disperse — even if the thistles have been cut down — so one needs to act fast if his thistles are starting to bloom. Which is why I’ve been cutting thistles in recent days and disposing of them in my green-waste container. “I think I have a pair,” I told him. “They’re from a World War II naval shipyard.” As it happens, my parents after the war had bought two pairs to use in gardening from an Army-Navy surplus store. And sure enough, when I looked in a basement cabinet, I found an old welder’s glove — but only one for the right hand. After more digging around in the cabinet, however, I found a second glove. Unfortunately, when I went to put it on, it too was for the right hand. There was a bit of cursing, but then I resumed my search and eventually found a left-handed glove in a tangle of twine. More important, when I used these almost-70-year-old gloves in my next assault on thistles, I got through it unscathed. So what’s the moral? It takes gear tough enough to defeat Prime Minister Hideki Tojo’s navy if one is to escape being wounded when attacking West Marin’s thistles. I’m sorry to hear that Mike’s cattle aren’t eating distaff thistle. We trained them to eat both distaff and Italian, so at least the Italian part stuck with them. I do recall going to visit their place post-training and we’d actually noticed distaff that had been bitten off by untrained animals. I think one of the problems may have had to do with the fact that we didn’t actually get to the final step of the training. Normally the trainees get placed in a trial pasture to work on learning to harvest thistle. I had to go home to Colorado before that happened, and when I returned to try again, Mike had whooping cough. On a more positive note, Lunny cattle that graze at John Wick’s and Peggy Rathmann’s ranch [in Nicasio] were also trained to eat distaff and Italian thistle. Though there are times during the growing season when the cattle don’t prefer distaff thistle, they continue to eat both weeds in pasture and have added other things to their diets like bull thistle and coyote bush. Kevin Lunny says the cows have almost completely eliminated the Italian thistle at their ranch in the Point Reyes National Seashore. 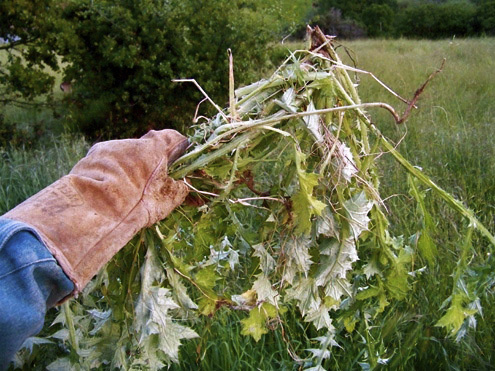 I love your picture of the welding gloves used for pulling Italian thistle. That’s what I wore when harvesting it for training, and I even remember that the spines sometimes poked on through. Good luck with your pulling! Those are some tough thistles! Thanks for the comment, Kathy. I just spent half a day pulling up more thistles, and as you experienced, a couple of spines managed to pierce even the welders’ gloves. The best cure for getting rid of the sting from thistle pricks, I’ve read, is to wash the affected area with white vinegar. Not having any, I tried Balsamic vinegar. It worked although it left my hands smelling like an Italian salad. As you know, the cypselas of the thistles can blow for miles so there’s no end to the seed source. And you may have seen vetch on your land. Hairy vetch (Vicia villosa) has been shown to set the stage for colonizaton by Italian thistle enriching the soil with their nitrogen-fixing bacteria. I live in Corte Madera, not on a West Marin ranch, and Italian thistle is taking over my back yard as well as many other yards in the neighborhood. I see more and more on Mt. Tam and other county open space areas. Cattle grazing isn’t an option, and even with heavy gloves I can’t even get them out of my own yard, let alone the rest of the county. They are worse than Scotch broom. They grow incredibly fast. Will anything stop them, or can we expect all of Marin to be carpeted by thistle in a few more years? Does anyone care? Goats will eat anything. As a child I recall seeing goats eating the fiberglass body of a Corvette in the northern part of Iran. The car had a fender bender and the fibers under the paint had been exposed. There were two goats eating the Corvette. If they eat that, thistle should be like a cream puff for them. Goats are also easier to fence off, and to let loose in smaller backyards. I’d just be careful to not let them wonder near any laundry hanging on a line. Sparsely Sage and Timely is powered by	WordPress 4.9.10 and delivered to you in 0.452 seconds using 56 queries.